Removing duct tape residue from glass can be easy with the right tools. Having massive amounts of tape residue on glass usually happens after boarding up windows in preparation for a hurricane. There are actual companies that are located on the east coast of the USA that do this for a few months after hurricanes. If you have tape residue from either masking tape or duct (duck) tape, then try these 5 methods to easily remove it yourself. Most of the things we have listed are things you will already have in your home. The methods below will also work on your car windows, different types of plastic, wood, walls, and much more. Razor Blade – Use a fresh razor blade (with a handle for safety) to scrape the tape residue off. This is the best way to remove the sticky residue without using any chemicals. Goof-Off – Moisten the tape residue with goof-off and then wipe off with a cloth. Use a razor blade if needed. WD-40 – Spray the water displacement spray on the window and let it soak into the residue. Once soaked wipe off with a towel. Use a razor blade if needed. Paint Thinner – Use this product carefully as it has a harsh smell. Moisten the tape residue with the thinner for a few minutes to let it help loosen it. Then wipe with heavy pressure with a clean cloth. Use a razor blade if needed. Nail Polish Remover – This is not created to remove sticky tape residue but it works if that is all you have. Let it sit for a few moments on the residue and wipe off with a clean cloth. Use a razor blade if needed. Duck Tape or Duct Tape? Many people don’t know whether the tape is called duct tape or duck tape. It is historically called duct tape because it was designed to tape up ducts for HVAC purposes. However, Johnson and Johnson manufactured an olive drab tape in WWII that the troops dubbed duck tape as it repelled water. So calling it Duct Tape or Duck Tape are both correct. I put duct tape to hold a small TV Cable box in place. Now I need to remove adhesive marks from the tape without damaging the TV screen. Any ideas? Can’t use WD-40. I’m at a loss..need assistance. 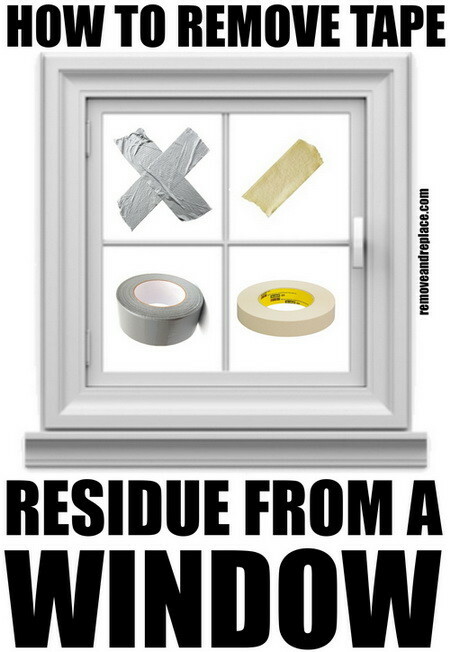 You can try using simple window cleaner with ammonia and get the duct tape adhesive soft and then carefully removing it. If the adhesive is not coming off that way, you can use simple household rubbing alcohol to remove the adhesive. Once you apply it to the screen, remove it as fast as possible to avoid damaging the TV screen. This should NOT damage your TV screen and remove the duct tape adhesive completely.